I arrived in Venice via train, and upon leaving the Santa Lucia train station (one of the very few modern buildings here, constructed in 1954), the city hit me with its full force, and I stopped to take it all in. This is easily one of the most dramatic entrances to a city you’re likely to experience anywhere in the world: You’re immediately greeted by the Grand Canal, by San Simeon Piccolo, waving ciao! atop the giant green dome of his church — and by hundreds of people with more luggage than I have ever seen in my life, including at airports. 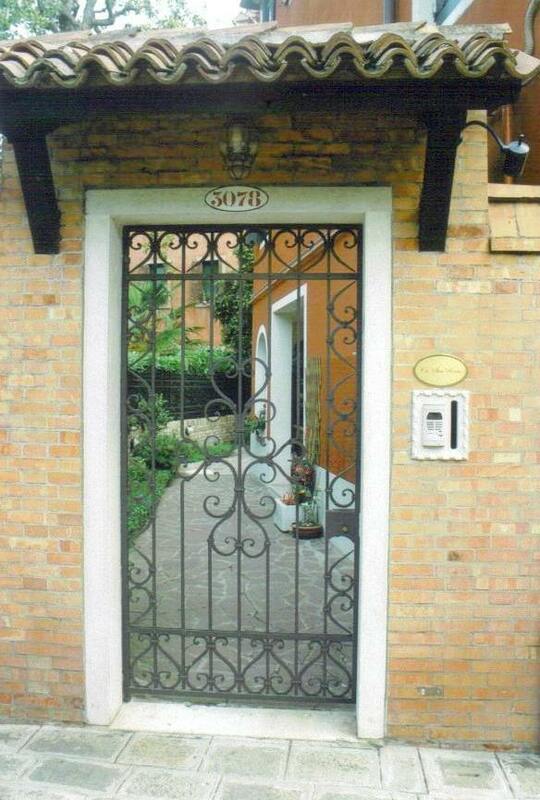 The discreet and secure gate entrance entices you with a peek at the wonderful accommodations on the other side. I took a deep, cleansing breath (the canal is nowhere near as fetid as many rumor it to be) and merged into the crowds. Armed with an extremely detailed map to help me navigate my way to my accommodations, I put the chaos behind me by crossing over the Ponte degli Scalzi, one of the biggest and highest bridges in the entire city, and entering the farrago of Venice’s streets, campi, passages, and canals. Down a quiet alley about five minutes away, I almost missed the entrance to my bed and breakfast — an unobtrusive gate door in a brick wall next to an intercom and a small oval sign bearing the establishment’s name, Ca’ San Rocco. I was buzzed in and I followed the stone path onto the covered patio and into the small, cool lobby with a mosaic of Venice in silhouette attached to the front desk. Once I checked in, I climbed up to my second-floor room where I would be living for eight nights. Immediately, I knew I had made the correct choice of staying within Venice. All six bright, spotless bedrooms at Ca’ San Rocco are decorated in shades of red or blue and feature garden views and roomy bathrooms. The 18th-century furniture complements all the modern conveniences, from electronic blinds that I controlled with a switch to free WiFi and effective air conditioning. Individually wrapped Tic Tacs nestled in a bowl next to my large, comfortable bed made for a nice little treat when I retired for the evening and tuned into the BBC on my room’s satellite television. 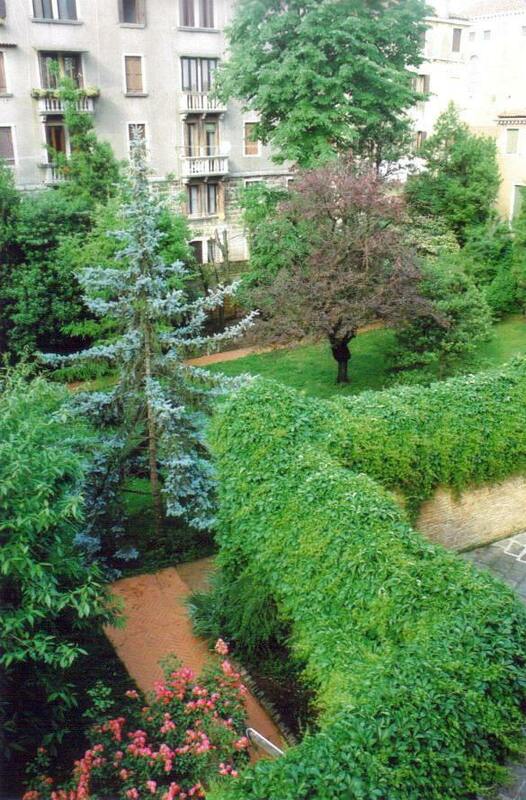 The tranquil garden outside your window eases you into your day. Located in the heart of Venice in the San Polo sestiere, Ca’ San Rocco is just around the corner from the Church of San Rocco and the fantastic Scuola Grande di San Rocco. A five-minute walk in any direction brought me to a handful of outstanding churches, a peaceful campo, the Grand Canal, the Leonardo da Vinci Museum, plenty of shops and restaurants, and the nearest vaporetto stop. Despite its central location, the noise level is low, and you won’t be disturbed by any canal or tourist traffic during a peaceful night. Birds in the garden, however, woke me up early every morning — a much more pleasant alarm than, say, the hovering helicopter, leaden-footed upstairs neighbor, or garbage truck that I’m inured to. But I didn’t mind that at all: The birdsong and morning view of the gardens outside my window provided a soothing way to start the day, and an outdoor continental breakfast gently coaxed me upstairs to the covered terrace. Lined with flower boxes, the terrace overlooks the wonderful garden of trees, flowers, shrubs, and herringbone brick paths below — an idyllic setting to begin your day over fresh pastries and cereals, yogurt and honey, Nutella on toast, and an impressive selection of teas. Voracious sparrows were not shy about approaching me for their morning meal, and the staff sincerely appreciated my attempts at speaking Italian. Generous serving hours encourage you to linger here in this tranquil setting and plan your activities for the day, whether it’s discovering beautiful churches that few tourists frequent or taking one of the world’s best boat rides. And at Ca’ San Rocco, you won’t be very far from any of them.